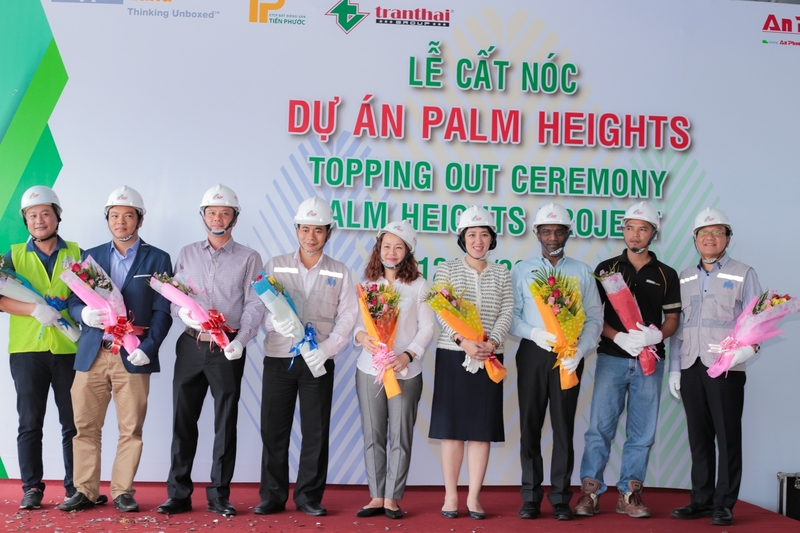 On 11/07/2018, An Phong Engineering & Construction Company Ltd, together with the developer of Palm Heights (a joint-venture between Tien Phuoc, Keppel Land and Tran Thai) have conducted the topping out ceremony of the project. Palm Heights features three 35-story towers with 816 luxurious apartments set amidst a wide range of recreation facilities. Over 450 residents participated “The Journey of Emotions” event held on April 21st, 2018 at Senturia Vuon Lai premises, where they enjoyed networking opportunity and experienced multiple amenities of the property such as swimming pools, community house, inner parks, and gyms. The marketing campaign initiated to promote the sales of the best properties at Senturia Vuon Lai project came into a conclusive end on September 12, 2017. Mr. Phan Hoai Thanh, owner of DO10-01 villa is the lucky winner of the event when winning for himself a brand new 2017 version Camry. October 10th, 2017, Tien Phuoc’s 25th anniversary was organised with a grand gala pivoting the theme of ‘Harnessing internal strength – Spreading prosperity.’ This is also the last in a series of events marking the 25th anniversary of the corporation. Many of them are held to promote teamwork spirit and boost staff morale as well as expressing appreciation towards senior workers who had contributed their senority to the growth of Tien Phuoc. On July 7-8, 2017, Tilia Residences Towers officially unveiled its first sale launch at Empire City sales gallery. The event attracted nearly 1,400 visitors. May 20th, 2017, Empire City today announced the grand opening of its SGSU right at the project location (Thu Thiem, District 2). The event witnessed over 1000 visitors. At the show units, prospective buyers could experience panoramic views of the city downtown from the greatest height of Thu Thiem. The Frontage Road (parallel road to Long Thanh – Dau Giay Expressway in District 2) is a 808-billion dong project developed by Tien Phuoc by means of PPP model. The project was initiated on April 29th, 2017, marked by a ceremony well attended by 80 guests who were significant figures from municipal and local authorities as well as leaders from Tien Phuoc and real estate industry. “Spring Love Melodies” Event on January 8th, 2017 was held as a token of Tien Phuoc’s appreciation to nearly 200 customers of Senturia Vuon Lai Project, as lunar new year was approaching. Some famous singers and musicians attended the event, including Phuong Dung, To My, Quoc Dai, who performed some timeless songs about spring and love. December 10th, 2016, the introductory event for Linden Residence by Empire City was unveiled today at The Reverie Hotel with over 800 participants. Empire City is a unique international standard complex property including luxury high-end apartments, A-class office lease, 5-star hotels, malls, and the highest observatory tower at Thu Thiem New Urban Zone. Located at a favourable location, Palm Heights today announced the grand opening of its contemporary sales gallery, including 2 & 3-bedroom types ranging 76 m2 and 123 m2 in that order. As a continuation to successful projects developed by joint venture Tien Phuoc – Keppel Land – Tran Thai, on October 15th, 2016, Palm Heights Luxury Apartments announced the grand opening of the Palm Height property, attracting over 800 interested visitors, many of whom decided to close the sale deals. This is the completed second stage of Palm City Urban Zone. Senturia Vuon Lai was officially launched for sales on September 18th, 2016. Initial responses were remarkably positive, indicating market enthusiasm and high demand rates from many different areas of Saigon as well as Hanoi. Senturia Vuon Lai was unveiled to loyal customers of Tien Phuoc on August 10th, 2016 in an event that attracted over 100 participants. Located at a prominent location with two riverfront facades (Saigon river and Rach Gia channel), Senturia Vuon Lai was expected to become a top-notch leisure villa property in An Phu Dong Ward of District 12. On July 30th, 2016, Palm Residence announced the grand-opening ceremony with 600 registered vistors. This is a 30.2-ha townhouse – mansion project belonging to Palm City Urban Complex situated on the Frontage Road (Nam Rach Chiec Residential Zone, District 2, HCMC). As many as 150 real estate consultants from HCMC prestigious property trading floors attended the introductory event early this August 2016 at Le Meridien Saigon Hotel. This is the first project in a chain of Senturia-branded projects to be launched by Tien Phuoc Company, featuring 194 items to sell including low-rise adjoining townhouses, semi-detached villas, single-detached villas.